Bored of the plain old camera straps? Then you’ve got to explore Kiki Store—a handcrafted camera strap store where you can get your hands on straps made from Indian fabrics. Raise your hands if you have been waiting to quirk up your camera with straps that make you stand out in a crowd. 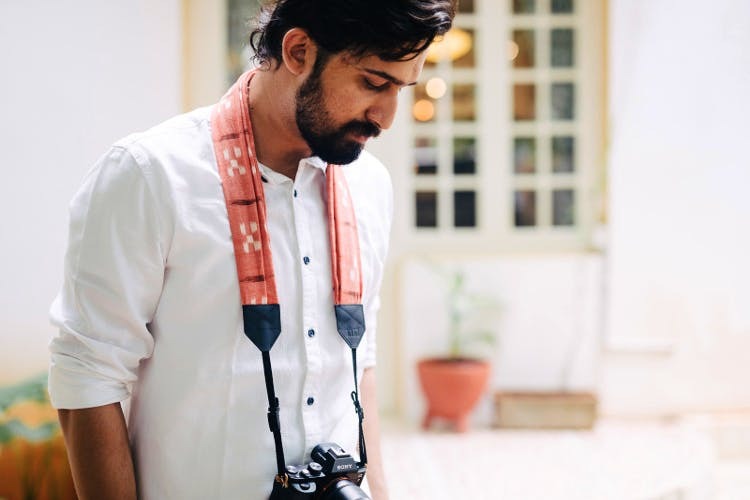 Kiki Store, run by Kishor Krishnamoorthi, a popular photographer from Hyderabad (we are always crushing on his work) is fill with straps that are handmade by skilled artisans. Fashionable enough to flaunt, these straps are handwoven and usually bring materials such as ikat, vegetable tanned leather etc. into play. Kiki sources ikat from Pochampally and tanned leather from Chennai, so you know premier Indian fabrics go into the making. If flexibility is something you are leaning towards, you can tick it off your list, as these straps are expandable; plus, you can wear them over your neck or shoulder. The expandability feature serves the purpose of keeping the camera light-weight as the pressure point of these straps is far wider than the otherwise traditional ones. Kishor and his team have also tested them for not just durability but to also ensure they are able to carry the heaviest of cameras, effortlessly. Fashion fiends and photographers looking for something functional (and pretty), we are hollering for you. Pick a Graphite Gray or a Blazing Red from the choices of camera straps—these two are apparently the bestsellers. But our heart goes out for the Tricolour Single Camera Strap for being irresistibly minimalist yet bright . Delivered in a reusable cotton drawstring pouch, these straps are compatible with all DSLRs and mirrorless cameras. Did we also mention that Kiki is experimenting with more diverse fabrics and are in the process of crafting dual camera straps for the ones who use two cameras during a shoot? It's a little on the higher side price wise, priced at INR 2,500 each, we still think this is an investment worth making.